296 pages | 14 B/W Illus. The public memory of slavery and the Atlantic slave trade, which some years ago could be observed especially in North America, has slowly emerged into a transnational phenomenon now encompassing Europe, Africa, and Latin America, and even Asia – allowing the populations of African descent, organized groups, governments, non-governmental organizations and societies in these different regions to individually and collectively update and reconstruct the slave past. 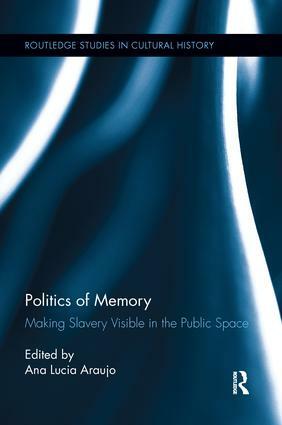 This edited volume examines the recent transnational emergence of the public memory of slavery, shedding light on the work of memory produced by groups of individuals who are descendants of slaves. The chapters in this book explore how the memory of the enslaved and slavers is shaped and displayed in the public space not only in the former slave societies but also in the regions that provided captives to the former American colonies and European metropoles. Through the analysis of exhibitions, museums, monuments, accounts, and public performances, the volume makes sense of the political stakes involved in the phenomenon of memorialization of slavery and the slave trade in the public sphere. Ana Lucia Araujo is Associate Professor in the Department of History at Howard University, USA. She is author of Romantisme tropical: l’aventure illustrée d’un peintre français au Brésil (2008) and Public Memory of Slavery: Victims and Perpetrators in the South Atlantic Laval (2010). She has also edited Living History: Encountering the Memory of the Heirs of Slavery (2009) and Paths of the Atlantic Slave Trade: Interactions, Identities, and Images (2011).